I dare to say that the Hong Kong news is the most accurate, quickest and neutral news organization in the world. I know many people say that Hong Kong is part of China since 1997. "The communist control the mass media...." Everybody says that, including Perry (my Husband). 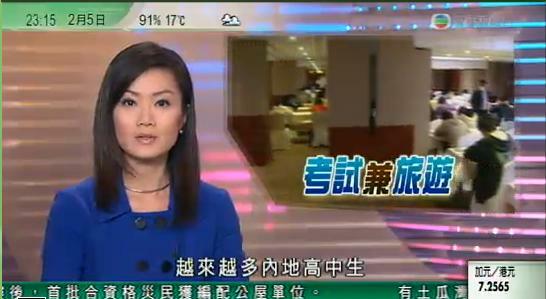 But HK news is NOT under any government control. If China does something to the journalist and/or any news organizations, The Hong Kong people go on rallying. It happened in the past and it will be the same in the future. My sister was an economics and political journalist for over 10 years in one of the neutral newspaper companies. She went to China all the time for reporting the news. She always shares her daily activities with our family. Therefore, I know how she works and how other journalists work. Because of the REAL freedom of speech and/or news, certain HK newspapers abuse this right. But there are some very good ones that are highly recommended and bestsellers at schools. Due to the difference between Hong Kong and China, it always thinks that the Hong Kong journalists violate the Chinese laws. The Hong Kong Journalist Association NEVER back down. If you check out its website, they protect and fight for the rights of the Hong Kong journalists. They made strong statements and complaints to the Chinese government. Now, tell me is this the freedom of speech? Hong Kong time is one of the advantages of Hong Kong's economical and financial prosperity. After living in the States for so many years, I still prefer to read and watch the news, including foreign news, through the Hong Kong mass media. Because I know that they always give the most neutral news without too much prejudice. Although Hong Kong mass media compete with each other fiercely, they don't report the news just because they want to get it out before their competitors. Yes, they always make sure to get it right at the very beginning. That is the reason why it is trustworthy.